The 2017 Six Nations kicks off on February 4th and is set to be the biggest to date. We’ve got reigning champions England gunning for the crown once again alongside France, Ireland, Italy, Scotland and Wales. Since the professionalisation of the sport in 1995, players have gone from big to huge in hope of gaining an advantage over their opponents. 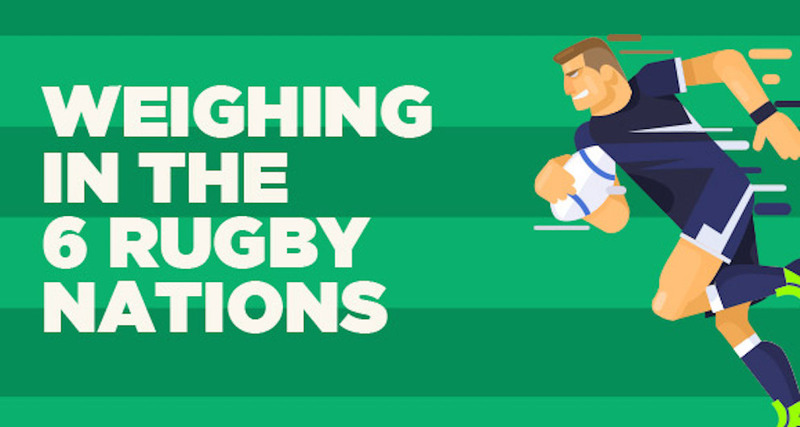 A larger body weight could potentially make a player less agile and slow them down, but with rugby union being a full-time professional sport with almost every team now employing sports scientists and expert trainers, players have turned this weight into pure power and strength. With all players fighting fit and healthy, the heaviest starting line-up this year is set to be Wales at 1591kg. 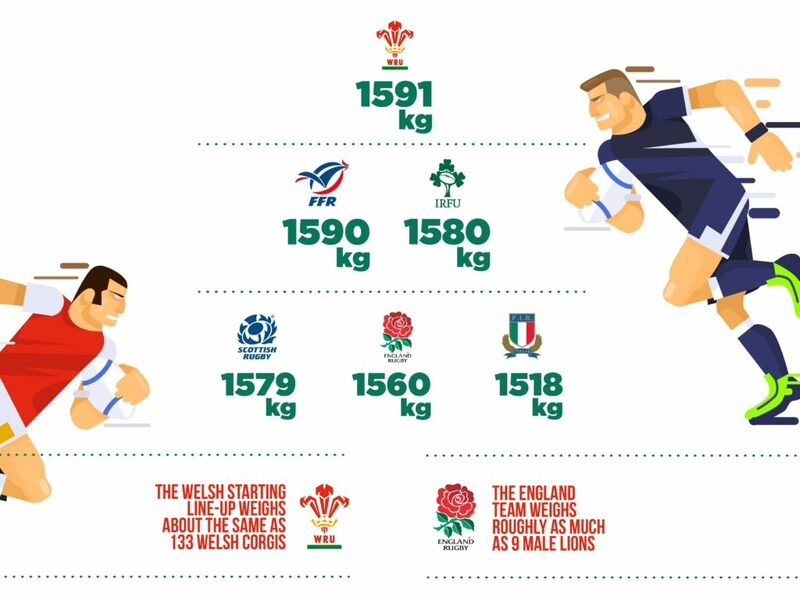 With 15 players starting a game, this makes for a staggering average player weight of 106.1kg, roughly the same as 133 Welsh Corgis. Just 1kg behind the Welsh team and in second place is the France XV. The starting 15 of Italy will be by far and away the smallest at around 1518kg, giving away 73kg to Wales. 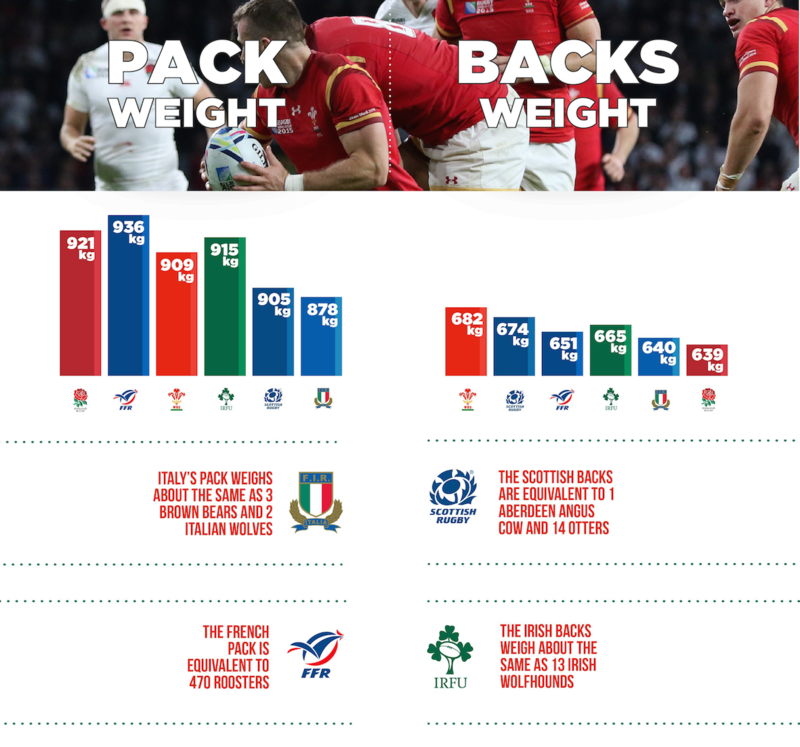 The French have the biggest scrum pack at a weighty 936kg, about the same as 470 roosters. This is some 15kg ahead of the Welsh pack who are in second place. Third in line for scrum weights is Ireland at 915kg followed by England, Scotland then Italy, whose pack weighs about the same as three brown bears and two Italian wolves. The Welsh dragons make up for their pack deficit to France with a huge back line, weighing in at around 682kg. It is these positions where you normally find the ‘smallest’ players but Wales defy most logic here with four players – George North, Jamie Roberts, Jonathan Davies and Alex Cuthbert – all way over 100kg each and lightning fast across the field. Compare this to England who has the lightest backline at 639kg, which equates to an average of around 91kg. Scotland also pack plenty of power in their backs positions and occupy second position with a total weight of 674kg, equivalent to a whole Aberdeen Angus cow and 14 otters.